Loot is two weeks old, and though it finally reached profitability this week, it’s too early to draw any lessons from the sales figures. I can say, however, that I had an object lesson in website analytics. * Direct Traffic (28%): People typing in the URL. * Gamerati Banner Ads (23%): People clicking on ads I bought on my own advertising network for gaming websites (PDF). * Facebook (19%): The daily Loot deals get syndicated to the Gamerati Facebook Page. With over 1,100 members, it generates a decent amount of traffic. * The Geek (8%): I started posting board game deals to Board Game Geek and roleplaying game deals to RPG Geek. This isn’t something I intend to continue (more on that in a future post, perhaps) but it did help get us off the ground. * Twitter (6%): I post the daily deals to my Twitter account, and numerous other people have been nice enough to retweet those deals. Thanks, by the way – keep it up! On Monday of this week, I logged into Google Analytics to check on the site traffic and had a present waiting for me. Whereas my best day of Week 1 saw 617 visits, Monday of Week 2 had 1,318 – more than a 100% increase. Clicking on the Traffic Sources link, I saw why… Apparently, we were mentioned on GameSpy.com. A little more investigation led me to this article by Aaron Williams, he of Nodwick fame. Take a look at Aaron’s article. Notice anything? That’s right, it’s not about Loot. The Loot love is all the way at the bottom, buried in a bunch of other links. And still… It drove a ton of traffic to my site. In fact, of the 4,334 visits to Loot this past week, 1,032 (24%) came from Aaron’s article. The moral of this story? It’s nice when someone with some juice offers to share it with you. Yeah. That’s nice. So what does that mean for me!?! I haven’t spoken with Aaron in over a decade, not since I took the above photo of him at San Diego Comic Con International 2000. I didn’t ask him to talk about Loot, but would have if I’d thought of it. The evidence is clear, though, that people like Aaron can really help you. * RPG Bloggers: If you want to connect with people who write blogs about roleplaying games, this is the place to find them. * RPG Podcasts: Same for podcasts about roleplaying games. * Board Game Podcasts: Ditto for podcasts about board games. You may not be able to count on altruism from your own personal Nodwick link. What you can do, however, is build relationships with those people who do have audiences that read and listen to what they have to say. The bloggers and podcasters on those sites are passionate about games, as are their audiences. Most of them will gladly mention something cool and new that a friend is doing, especially if it’s something their audience might be interested in. Sow some seeds. Make some new friends. 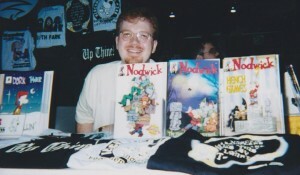 Oh… and while you’re at it, check out Nodwick and tell Aaron thanks for me. This entry was posted on Monday, March 28th, 2011 at 12:00 and is filed under Featured, gamerati, social media. You can follow any responses to this entry through the RSS 2.0 feed. You can leave a response, or trackback from your own site.